Recently at DDD North I saw a talk on MS cognitive services. This came back and sparked interest in me while I was looking at some TFS APIs (see later posts for why). However, in this post, I’m basically exploring what can be done with these services. For some reason that I can’t really understand, topics requires over 100 documents, and so I won’t be getting that to work, as I don’t have a text sample big enough. The examples that they give in marketing seem to relate to people booking and reviewing holidays; and it feels a lot like these services are overly skewed toward that particular purpose. Registration is free (although I believe you need a live account). // Request body. Insert your text data here in JSON format. The subscription key is given when you register (in the screen under “Set-up”). Keep an eye on the requests, too: 5000 seems like a lot, but when you’re testing, you might find you get through them faster than you expect. This is a basic sentence indicating an action. 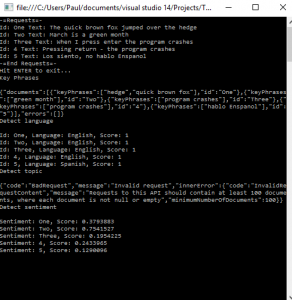 The KeyPhrases API decided that the key points here were “hedge” and “quick brown fox”. It didn’t think that “jumped” was key to this sentence. The Language API successfully worked out that it’s written in English. The Sentiment API thought that this was a slightly negative statement. This was a nonsense statement, but in a valid sentence structure. The KeyPhrases API identified “green month” as being important, but not March. The Sentiment API thought this was a very positive statement. Again, a completely valid sentence, and with a view to my idea ultimate idea for this API. The KeyPhrases API spotted “program crashes”, but not why. I found this interesting because it seems to conflict with the other phrases, which seemed to identify nouns only. Again, the Language API knew this was English. The sentiment API identified that this was a negative statement… which I think I agree with. The idea here was, it’s basically the same sentence as above, but phrased differently. The KeyPhrases API wasn’t fooled, and returned the same key phrase – this is good. Still English, according to the Language API. This is identified as a negative statement again, but oddly, not as negative as the previous one. I threw in a Spanish phrase because I felt the Language API hadn’t had much of a run. The KeyPhrase API pulled out “hablo Espanol”, which based on my very rudimentary Spanish, means the opposite of that was said. It was correctly identified as Spanish by the Language API. 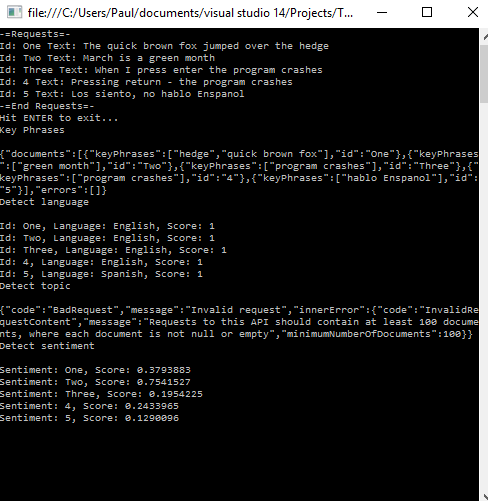 The Sentiment API identified it as the most negative statement. Perhaps because it has the word “sorry” and “no” in it? This entry was posted in C#, Microsoft Cognitive Services and tagged Azure, c#, Cognitivie, DetectedLanguage, KeyPhrases, Language, LanguageRequest, Microsoft Cognitive Services, RequestDocument, Sentiment, Text, Topics on December 29, 2016 by pcmichaels.